Happy Valentine’s (Galentine’s) Day to all of you!! I wanted to share a quick recipe that I whipped together last minute for a delicious V-day dessert! I love strawberries, & this recipe is so good. Since we do not typically celebrate/go out for dinner on the actual holiday, I like to cook a meal and dessert for us to enjoy together on the actual holiday. A lot of the time, we will cook and bake our meal together. For this dessert since I was experimenting and relatively had no plan in place, I let him enjoy some quality time with his other love, his PS4 Pro (a new addition to the family – eye roll). Let’s be honest, I told him I made this for “us” but I really made it for me and decided it would be rude not to share. The idea for this dessert came from my love of all sweets – haha – said every girl ever. This recipe is easy and simple even for an inexperienced baker, perfect for impressing that special somebody – or even taking it along for your Galentine’s night! I want to jump right in to this recipe so you can enjoy your day of love! 1. In an ungreased 12 x 9 baking sheet/pan, press the cookie dough. Create a small lip around the sides of the pan. Bake per the directions cookie dough directions. Allow to cool for 10 minutes. 2. Blend cream cheese, powdered sugar, & cool whip until smooth. I used a hand mixer for about 1 minute & that worked perfectly. 3. Spread the cream cheese mixture over the top of the cookie crust, using the entire mixture. 4. Layer the diced strawberries over the cream cheese mixture. **This step can be done numerous ways. The strawberries can be large slices or diced as I have shown above. Also, the amount of strawberries is up to you. We love strawberries so I used a full pound minus 2 strawberries for the garnish. 5. Spread the glaze over the top using a spatula to evenly distribute. 6. ENJOY with your love! Once again, I really hope you have a wonderful day with your loved ones, your gal pals, your pups, or even your independent self! This day is about love, so love yourself & enjoy a delicious treat! Yum! I will have to make these for my hubby, he would love them! Holy taste buds! This looks absolutely divine. 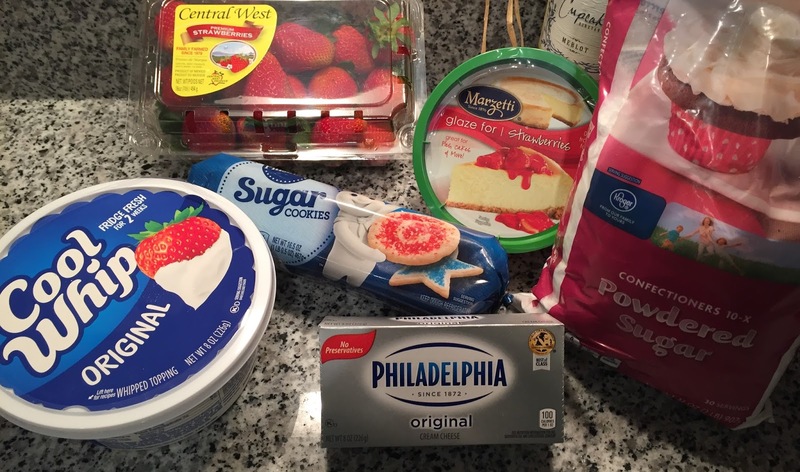 Tomorrow is my anniversary and I just may have to head to the store for these ingredients! Yum! I love strawberry desserts. This looks delicious! This looks absolutely delicious!! Strawberry desserts are my fav. This looks scary easy to make! I love strawberries! Wow this looks so delicious!!!! I'm pinning this so I can make it one day. Yum! That looks amazing! I love strawberries! I will have to give this a try sometime soon! this looks so good! I want to lick my computer screen right now! These look very yummy. Strawberries are the best. This looks amazing! My family would love this treat! my mouth is already watering! YUM!!! You know, normally if it's not chocolate I can pass but this looks really good!! Keep in touch with Joy! Every Day Beauty Essentials + $75 Giveaway!